So wrote the oft-quoted 19th-century designer William Morris. Notice he made no mention of garages. Perhaps the opposite rule applies there: Have everything in your garages that you know to be useless or believe to be ugly. At least that’s what it looks like in the majority of garages, which appear to be stuffed with everything but cars. This is because the garage tends to become a dumping ground for all the things we’re not quite sure what to do with: boxes of old records (both vinyl and paper); infomercial, impulse-inspired exercise equipment; small appliances that have outlived their usefulness yet are somehow “too good to get rid of”; and the inevitable unopened cartons of belongings from the last move. Then there are all those items that actually belong in the garage — if you can find them: tools, gardening supplies, bicycles, camping gear and sporting goods. And (dare I say it) maybe a car or two. 1. Focus. Think about how you currently use your garage versus how you’d prefer to be using it. For example, maybe you currently use it for “storage” (a euphemism for “dump”) but you’d like to be able to do woodworking or crafts projects there — or perhaps even park a vehicle inside. Decide how you want to use the space, and then sketch out a rough plan. 2. Inventory. 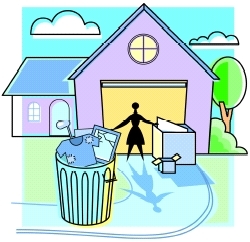 Make a list of the general categories of stuff currently cluttering your garage. Then go back through the list and put a check-mark by the categories you plan on keeping in your newly organized space, and a big X next to the ones you plan to eliminate. Keep in mind that “Miscellaneous” is not an effective category. If you can’t pinpoint an item’s purpose or place, get rid of it. 3. Deadline. Set a deadline for getting the job done, and block out time in your calendar or planner for your garage project. Tip: If you tie your deadline to an event such as a neighborhood yard sale, you’ll have a better shot at achieving your goal. 5. Dig In. Allocate two holding areas (outside the garage, if necessary) designated for “keep” and “don’t keep” items. (Suggestion: The area allocated for “don’t keep” should be at least twice as large as the “keep” area.) Your objective is to fill up the “don’t-keep” section. You may want to divide up this section with three or more containers labeled “trash,” “donate,” “sell,” or any other relevant subcategories. But keep it as simple as possible — creating too many options is counterproductive. Next, choose a path: Decide whether you want to work around the perimeters going clockwise or counter-clockwise, saving the middle for last (the Hostess Cupcake method), or if you prefer a top-to-bottom de-layering process (the Oreo approach). Whichever way you choose, what really matters is that you plow forward systematically instead of hopping back and forth from pile to pile or from area to area. Finally, set a ticking timer for small increments (10 or 15 minutes) to remind you to keep moving forward and not get sidetracked. Even useful and/or beautiful things become clutter when you have too many of them, or if they are kept in a way that diminishes their value to you. So here’s another good rule to live by: Keep the best and let go of the rest. HARRIET SCHECHTER is founder of The Miracle Worker Organizing Service and author of three books, including “Let Go of Clutter.” Her online advice column is at www.MiracleOrganizing.com.